Almonds are a superfood that contain 28 essential nutrients. The nutrients in almonds include proteins, vitamins, minerals, fatty acids, fiber, and much more. Almonds are made healthier by activating them. But what does activating almonds mean? What are activated almonds and are they more beneficial than ordinary raw almonds? Read on to find out. What does activated almonds mean? Activated almonds are soaked and dehydrated almonds. As almonds develop, they store the energy in the form of a phytochemical called phytic acid. The enzyme inhibitor remains in the nut after harvesting. It stops the sprouting process of the nut. It binds with the calcium, magnesium, and zinc which makes it difficult for the body to absorb almonds. Phytochemicals prevent your body from getting the maximum benefits of the nutrients in almonds. Various studies also show that soaking or germination decreases the quantity of phytic acid in almonds. It helps in the easy absorption of minerals in the blood. Soaking the almonds allow the germination process to begin. Germination helps break down stored proteins, starches, and oils in the nuts into energy. It helps the nut grow and shoot. Dehydrating them retains their crispiness and taste. 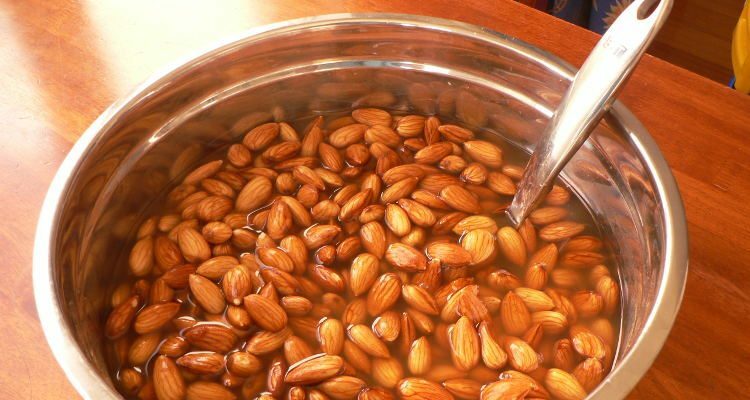 To soak almonds, you just need to wash them and leave them in a bowl of water for a couple of hours. You can add an activating agent such as kefir or a salty brine to activate the almonds. Soaking almonds or other nuts has been traditionally followed across cultures. It is a common practice to soak almonds overnight and eat them or add to recipes the next day. So, soaking is not a new concept; however, dehydrating them again is perhaps new or not so prevalent. Why do you need to activate almonds if you can eat them raw? Are activated almonds better for you than raw almonds? Here are seven activated almond benefits. Activation of the almond stimulates the sprouting and germination process, as the phosphorus stored in plants in the form of phytic acid obstructs enzyme inhibitors and also reduces phytic acid levels. Phytic acid binds to minerals in the digestive track that include magnesium, calcium, zinc, iron, chromium, and manganese. If we consume foods containing phytic acid, it interferes with the body’s absorption of minerals and may result in mineral deficiencies. Humans lack an enzyme called phytase that breaks up phytates. One of the best ways to reduce phytic acid is to soak, sprout, or ferment the nuts. Activated almonds help protect against heart disease, high cholesterol, and diabetes. They also help to manage weight and appetite. Eating raw almonds may hamper the digestion and absorption of minerals present in them. If you feel heavy after consuming raw almonds, it may be a sign of indigestion. Eating activated almonds will help digest them better. People who suffer from digestive issues and are on a healing diet such as SCD, GAPS, or Paleo AIT should consume activated almonds. Activating almonds helps preserve them for a longer time. You should note, however, that the benefits of activated almonds required more scientific research and evidence. More study is required to prove that they are better than raw almonds. You can always go out and buy a pack of activated almonds from the store. But that will leave you with a big hole in your pocket. So, how about making it yourself? Here is a simple activated almond recipe. Put raw almonds in a bowl and rinse them several times. Washing removes the tannins in the skin which interferes with the minerals in the nuts. Then, cover the almonds with water. Add water kefir, milk kefir, sauerkraut juice, kombucha, live whey, or unpasteurized apple cider vinegar with the mother—any one of these will do. Then, add salt to activate the enzymes which will help deactivate the enzyme inhibitors. Now, you need to know how to dry almonds properly. To do this, dehydrate them on low heat in a dehydrator or an oven. If you are using an oven, set it to the lowest temperature. Dehydrating will require 12 to 24 hours when the temperature is set between 105 to 150°F. The almonds should be dry and crispy. It may take around five to six hours depending, on your dehydrator. How Long to Soak Almonds? To make activated almonds, you should soak them for at least seven hours and up to 24 hours. Ramiel Nagel’s article published in Wise Traditions recommends soaking the almonds for 18 hours and then dehydrating or roasting them at low temperatures to eliminate the anti-nutrients. Activated almonds may have certain benefits but require more evidence. So, you can very well eat raw, soaked, or roasted almonds if you do not have the time to make activated almonds. The important thing is to consume the nutrients in almonds, including a lot of other nutritious foods like veggies, fruits, sprouts, whole grains, meat, and dairy. This way, you will surely benefit from the nutrients in all of these foods. If you consume just five to eight almonds every day, then you may want to consider the time or money required for activated almonds and the feasibility of the same in individual context. You can have almonds either raw or activated; both taste delicious. Just remember they are high in calories so don’t overeat them. So, limit your intake and reap maximum benefits. “How to make activated almonds at home,” Natural Maven, November 2, 2011; http://naturalmaven.com/how-to-make-activated-almonds-at-home. “How To Soak And Dehydrate Nuts (Nourishing Traditions Method),” Mommypotamus; https://www.mommypotamus.com/how-to-soak-and-dehydrate-nuts-the-nourishing-traditions-way/, last accessed June 15, 2017. Saxelby, C., “Activated almonds, anyone? A balanced view,” Catherine Saxelby’s Foodwatch, November 5, 2012; http://foodwatch.com.au/blog/in-the-news/item/activated-almonds-anyone-a-balanced-view.html. Bosch, L., “Should You Activate Your Nuts And Seeds?” Food Matters, March 3, 2016; http://www.foodmatters.com/article/should-you-activate-your-nuts-and-seeds. “Why You Need to Activate Nuts and Seeds — How To Do It,” Real Food Forager; https://realfoodforager.com/why-you-need-to-activate-nuts-and-seeds-how-to-do-it/.